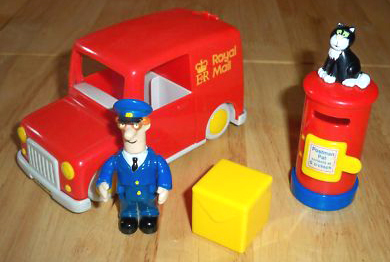 UK toymaker Golden Bear Toys once held the licence to make Postman Pat toys. Golden Bear released a set with Pat and Jess with a rather distinctive take on Pat 1 (red livery with yellow wheels and lights). Included in the set were a red postbox with opening door and a large yellow parcel that can be fitted into the opening rear doors of Pat 1. Also available was a very colourful take along Post Office, with inbuilt carrying handle, sporting yellow walls and a blue roof. The Post Office playset opens out to reveal an interior with an opening counter, post office box and front door. The Golden Bear Postman Pat figure featured moveable limbs. The Mrs Goggins and Mrs Dorothy Hubbard figures had fixed poses. Mrs Goggins is holding a letter and Mrs Hubbard has her arm out as if holding an imaginary walking stick. These Postman Pat toys by Golden Bear are quite hard to find today so could be one to watch out for in the future.